As part of an independent communications consultancy with a microscopic fraction of the revenue from Burson Cohn & Wolfe, it stands to reason that I don’t buy into the “bigger is better” position. Of course, what the news release states doesn’t necessarily align with reality. As a public service, I’ve reverse-engineered the news release distributed over Business Wire chunk by chunk. 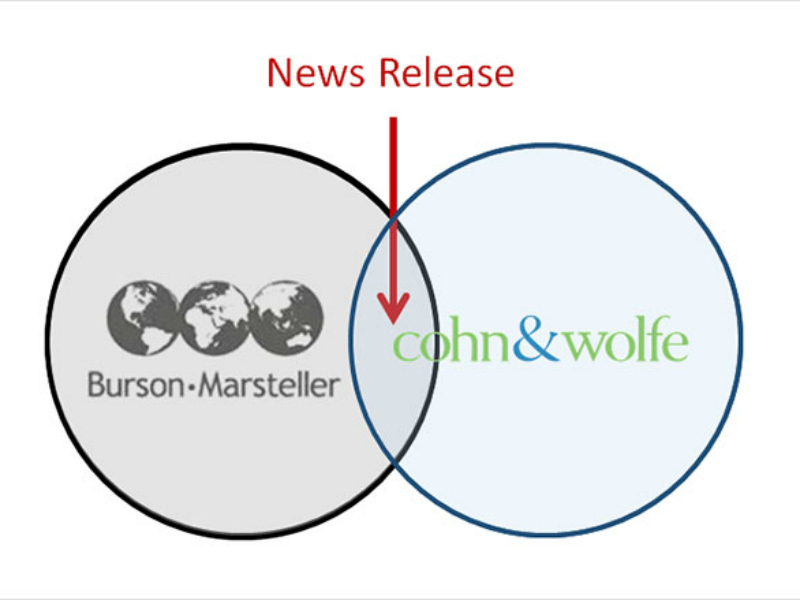 NEW YORK–(BUSINESS WIRE)–WPP (NYSE:WPP) today announced the merger of Burson-Marsteller and Cohn & Wolfe to create Burson Cohn & Wolfe (BCW), one of the world’s largest, full-service, global communications agencies with deep expertise in digital and integrated communications, across all industry sectors. Commentary: The lead captures the thrust of the announcement. William Marsteller loses his real estate in the name. I suppose Burson-Marsteller Cohn & Wolfe doesn’t exactly roll off the tongue. Commentary: Takes care of the leadership housekeeping. Commentary: I’m sorry, but the synergy doesn’t ring true. Are they saying that BM isn’t digitally driven? This is about financial performance, gaining economies of scale to goose profitability. We’ll see heads roll next quarter. Commentary: Now there’s fresh sound bite that will resonate with journalists. Commentary: Remember News Release Writing 101 saying to avoid hyperbole, that adjectives like “breakthrough” and “revolutionary” bring out the cynicism in journalists. Imperato didn’t get the memo. Again, this marriage has nothing to do with clients. The new entity is going to deliver exactly what the old entities delivered to clients only with less overhead. As for that “executive group” who will oversee the merger, those are the guys/gals who will decide what heads roll. As part of an independent communications consultancy with a microscopic fraction — now there’s a good use of an adjective — of the revenue from Burson Cohn & Wolfe, it stands to reason that I don’t buy into the “bigger is better” position. If you took all the organizations in the world that buy communication services, I believe over 90 percent of the budgets are less than $30K per month. Even at the high watermark of $30K per month, that’s a four to five person account team. I’ll take our five-person account team against a mega shop’s counterpart any time. With rare exception, the synergies touted by mega shops are fool’s gold, code for economies of scale. "I want to be the best global agency in the world. This wasn’t done to find cost-efficiencies — that wasn’t even part of the discussion." Not even part of the discussion? Let me get this straight. Sir Martin Sorrell signs off on smushing together a $480M agency with a $224M agency and never raises economies of scale. It never occurs to him that stripping out the duplication in infrastructure will allow the $704M mega shop to increase profitability in a way that wasn’t possible when revenue was split between two agencies. On the positive side, Imperato did stay on message. It seems odd that the website for the new entity wasn’t ready to go when the news release went out the door. Maybe they figured the services are the same, so they’re good to go and can deal with the branding downstream. Lou Hoffman heads The Hoffman Agency, an integrated communications consultancy that specializes in the tech sector and other markets of complexity. Beyond client campaigns, the firm offers a half-day workshop on its storytelling methodology.